We caught up with Ellen on Friday morning as she neared Rothesay on her 17-mile sponsored walk in aid of the Scottish Cot Death Trust in memory of her late granddaughter, Emma. Kilchattan Bay resident, Ellen Cromack, has completed her 17-mile sponsored walk around the island in memory of her late granddaughter, Emma. 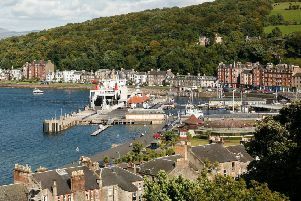 Ellen set herself the challenge of walking from her home at the south-end of Bute to Rothesay via the West Road, returning via Ascog, to raise money for the Scottish Cot Death Trust. Ellen’s granddaughter was just five months old when she died suddenly in 2009, and Friday, February 26, marked the seventh anniversary of her death - the day of Ellen’s walk. Ellen said: “I set off from Kilchattan Bay at 7am, and I got into town at about 9.50am, just in time for the service at St Andrew’s Church at 10am where I lit my candles. I left the church at about 10.40am and headed down to the Discovery Centre for the charrette. Ellen walked a grand total of 17 miles, and has advised she’s leaving the collections open until Easter. So far, she’s banked £200 in cash, with over £200 on the online tally, and even more to collect in from sponsor forms in the island’s shops and businesses, including from the post offices in Rothesay and Kilchattan Bay. If you’d like to donate to the Scottish Cot Death Trust in support of Ellen’s walk, visit her JustGiving page.